A big part of getting kids involved is letting them be involved. While I am not entirely on board with creating a need for “stuff” in kids, letting them have a few pieces of equipment just for them can go a long way toward generating ownership in outdoor activities. If you’re anything like our family, you’ve already been camping this summer a couple of times, and you wish you had time to go a couple time more. There’s really no better way to really get kids outside than to really take them outside with a weekend of camping. I’ve already shared with you some of the books I’ve used to learn how the experience can be a bit less chaotic and a bit more enjoyable. Now I want to tell you a little about some of the gear we take camping. Like everything else, there’s always a new line of camp stoves, sleeping bags, tents, and backpacks�better fabrics, lighter materials, etc.�but when it comes down to it, most of this gear is simply the solution to a problem we never knew we had. 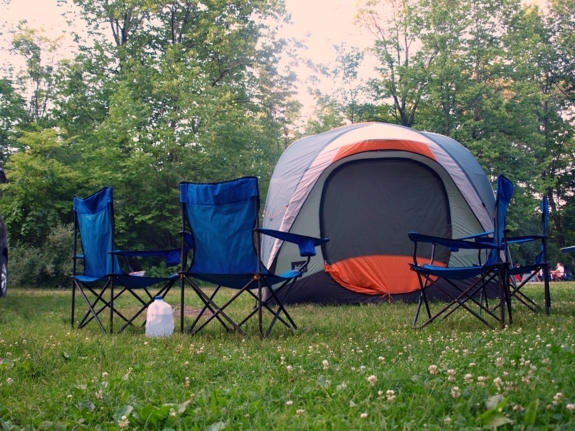 One particular trend I’ve seen in recent years, however, has promise, and that�s the growing attention camping manufacturers are paying to the kid market. Today I want to look at two particular items. The first is a backpack from Lucky Bums. The folks at Lucky Bums are all about the kids, and they sell gear just for the little ones in your family. It�s not the wimpy gear you might expect coming down the pike for kids. This is robust stuff. 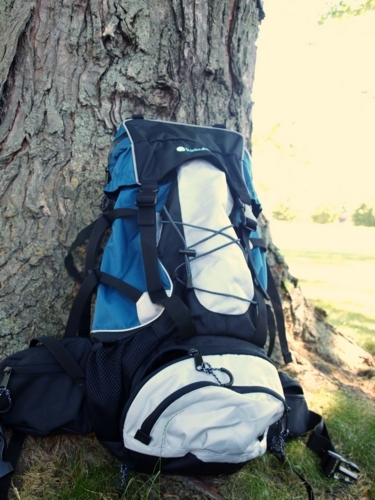 We tested the Rumba 35L Multi Night Backpack. This pack has all the bells and whistles (literally; the sternum clip has a whistle built right into it) you see in quality adult bags at REI. The pack has tons of room, and your kids can easily “carry their weight” next time you decide to hit the trail as a family. We haven�t tried it on an overnighter yet, but we�ve been taking practice hikes with loaded packs, getting ready for the next adventure. So far the bag out performs our highest expectations. Fully adjustable, tons of pockets, and straps on the top hold down a sleeping bag. All you would need for a rugged trip would be a way to keep it dry in the rain, but I think a poncho thrown over the back would do just fine. Only drawback we�ve found so far is that this pack makes ours look kind of lame. The second item we�ve been testing is from Sierra Designs. 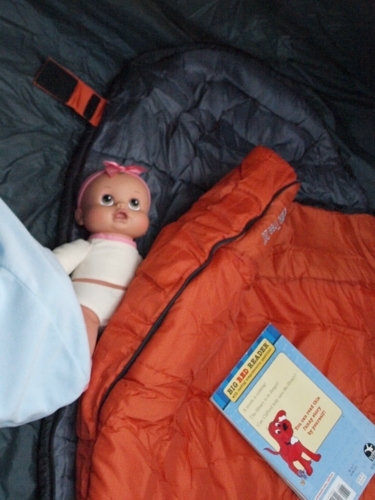 This company recently unleashed a line of specialty sleeping bags just for kids. When I was young, we slept in old flannel sleeping bags that were always too hot for summer and too cold for winter. Today�s kids can enjoy the Dragonfly 20. Again, another piece of gear for kids that make our gear look childish. This sleeping bag is nylon, but the foot box is lined with tricot (just means it�s fuzzy and warm, not slippery and cold). At the feet there�s an attached bag, or you could simply use the stuff sack. At the top, an integrated hood helps trap body heat, and the zipper never gets caught. The one feature that has me puzzled is the snack pocket. Supposedly this will keep your snickers close, but for campers who wisely keep all food out of the tent, it seems an unnecessary extra�though it might be good for your iPod or watch or other personal items. Grace has claimed the Sierra Designs bag with authority, leaving her Kelty sleeping bag to her brother. The Kelty bag, a Little Tree 20 Junior, was our first camping gear purchase especially for one of our kids. While she didn’t go crazy when she first saw it, a year out it was still her favorite gift from that Christmas. The bag is solid, just what you expect from Kelty, but sized for a kid. There are more companies out there making gear for kids than ever before, and I suspect as we go along we�ll start to see some fairly poor-quality items hitting the market. So far, however, I�ve been impressed. REI and Moosejaw carry kids gear from all over, and hopefully we�ll continue to bring you reviews of the best stuff we find to make your next family camping road trip a success.